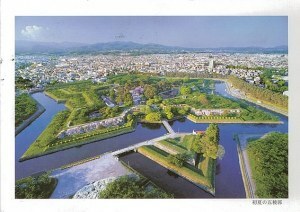 Gory?kaku is a star fort in the city of Hakodate in southern Hokkaid?, Japan. It was the main fortress of the short-lived Republic of Ezo. Built by the Tokugawa shogunate in 1857-1866, it was located in the center of the port of Hakodate, on the island of Hokkaid?. Shaped like a five-pointed star, it allowed for greater numbers of gun emplacements on its walls than a traditional Japanese fortress, and reduced the number of "blind spots" where a cannon could not fire. In designing Goryokaku, Takeda Ayasabur?, a Rangaku scholar, adopted elements of the designs of the French architect Vauban, who developed fortresses responding to the spread of the use of cannon in warfare.